Below is a new image and caption that I added to the Trombone History Timeline (18th century). You can also see it in my collection of more than 100 angel trombonists, Angel Trombonists throughout History, and in the Google map plotting locations of more than 280 trombone images, Interactive Map of Trombone Art. 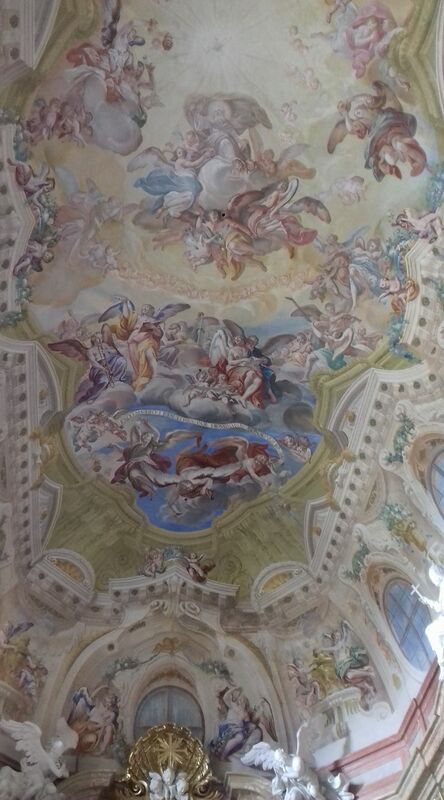 1726-1729—Valtice, Czech Republic: The Baroque chapel of the Valtice castle (also called Valtice chateau) is designed and decorated by Italian architect and artist Antonio Beduzzi. A fresco on the ceiling of the chapel includes a depiction of an angel playing the trombone (see below image; public domain) (special thanks to Richard Šeda).